Uganda has one of the fastest growing and youngest population in the world. While this can be a good basis for economic growth, it also poses an immense challenge to the country in the form of widespread youth unemployment, which can threaten the political stability and the sustainable development of the pearl of Africa. 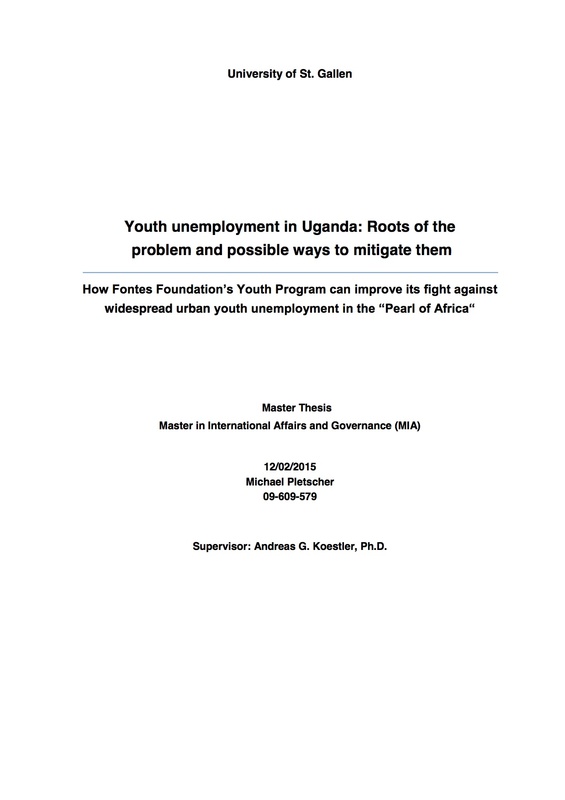 This master thesis is analysing the reasons that are at the source of urban youth unemployment in Uganda. To reach this goal, the youth centre of the Norwegian based Non-Governmental Organization Fontes Foundation serves as a case study, which is located in the suburbs of Uganda’s capital Kampala. On the basis of interviews and focus group discussions with the affected youth, the personal experiences of the author working as the Regional Coordinator for Fontes Foundation in Uganda, comparisons with other NGOs’ youth programs as well as academic research, those reasons will be identified for the specific circumstances of this youth centre. Furthermore, several suggestions for improvement are being made about how the organization can improve its fight against widespread urban youth unemployment. Pursuing the goal of being practically relevant and implementable, those suggestions are again specifically tailored to the situation that Fontes Foundation’s youth program is facing and should serve as a starting point for future projects and program extensions at the youth centre.